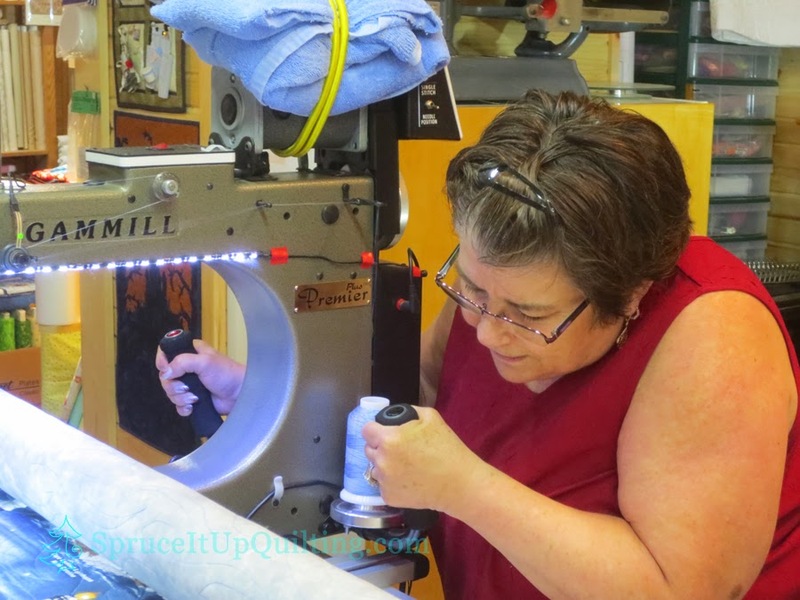 Spruce It Up Quilting: Lighting the way! Since the last 2014 fabric shipment arrived, we've played around with panels. 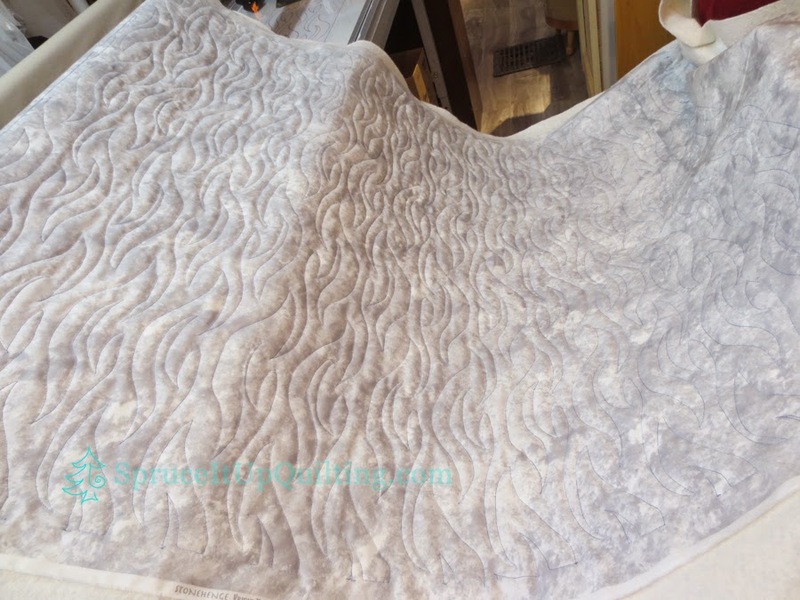 Marie and I both need inspiration to redesign a panel into a nice wall hanging or lap quilt. We take ideas from each other but our main resource is Hollie who has been doing this a lot longer than we have! 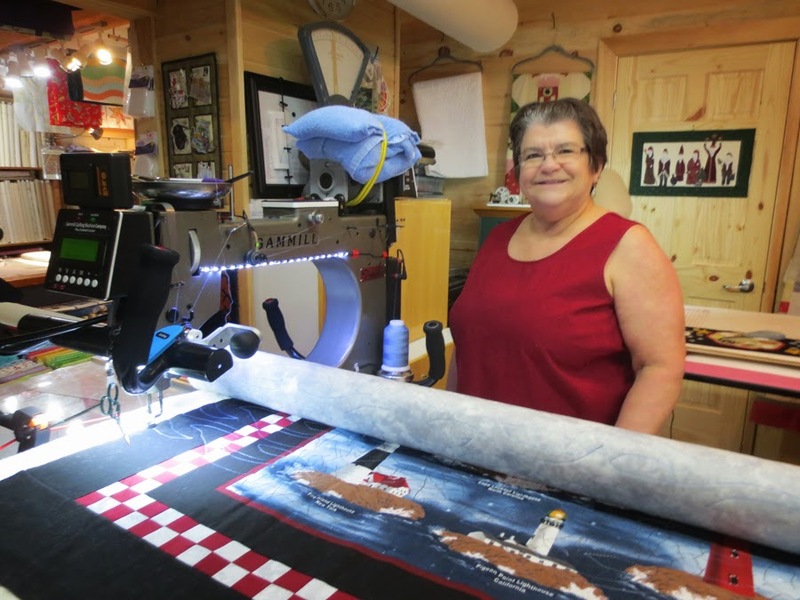 Marie made her own choices on this lighthouse and it is beautiful! Any chance to quilt on Lolah is welcomed! Marie is no stranger to Lolah but she feels comfortable quilting her favorite panto (Chinese Crescents). 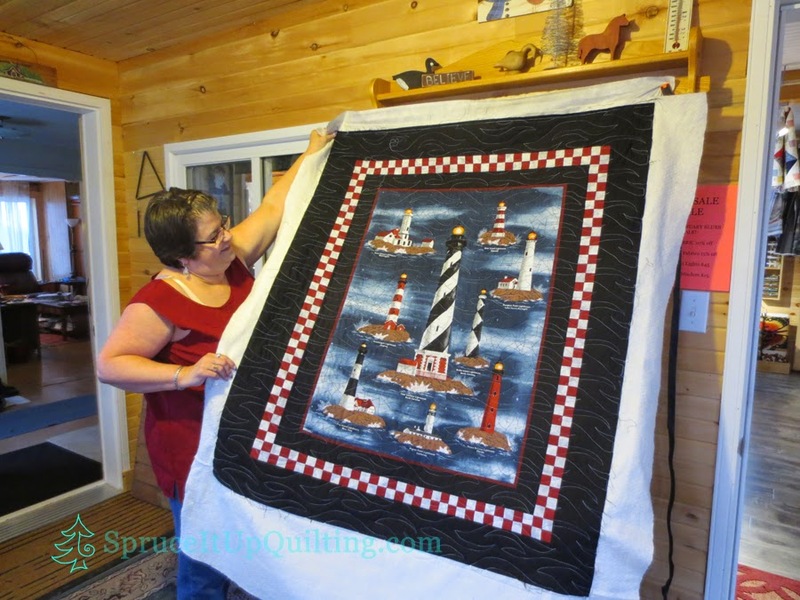 This would not be a good choice for the lighthouse so she went with Ebb and Flow pantograph designed by Hermione Agee for Lorien Quilting, Superior Threads King Tut #904 thread which is a variegated baby blue and 80/20 batting. 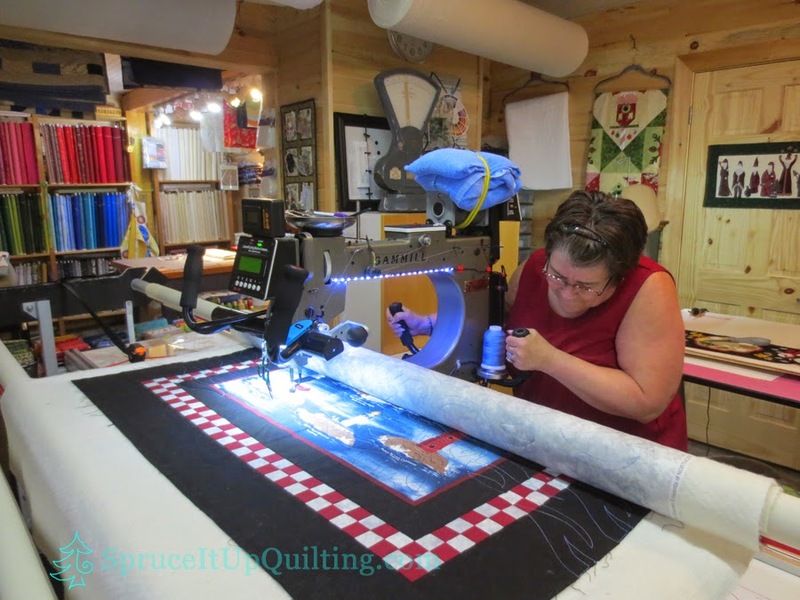 In making a selection of a quilting design, one must look at the direction of that design and what effect it will give you on a quilt. This particular pattern looks soothing when quilted side to side but if you were to quilt it vertically, you'd be looking at flames! Not really what we wanted so this determined how we loaded Lolah. One could be forgiven if they thought we quilted this in June or August! No... this was January and if she could, Marie would quilt with the window open. Off come the shoes too... anything to get comfortable. Comes see it in the shop... it's bound and on display. Well done!! Look at that checkerboard border! Smart idea Marie! This would make a lovely cottage wall hanging or lap quilt. That last fabric shipment included 28+ panels: some baby, some nautical, some wilderness themes. We photographed them, packaged them individually and put some on display. The intention was to print the photographs and put them in an album for ease of browsing through them. We simply don't have the room to display them all. Since then, we've received more fabric panels which will be added to the album. I recall 12 Days of Christmas, Frozen book panel, more baby... we keep finding more! This new problem is fan related... we think! A replacement has been on order for almost a month... no sign of it yet! Keep your fingers crossed! The panel photos are now ready to be printed. Let's hope the printer is up to snuff! You must come in to see our new addition to the shop! Thanks to our contractor who delivered the plywood and to my DH who built these! 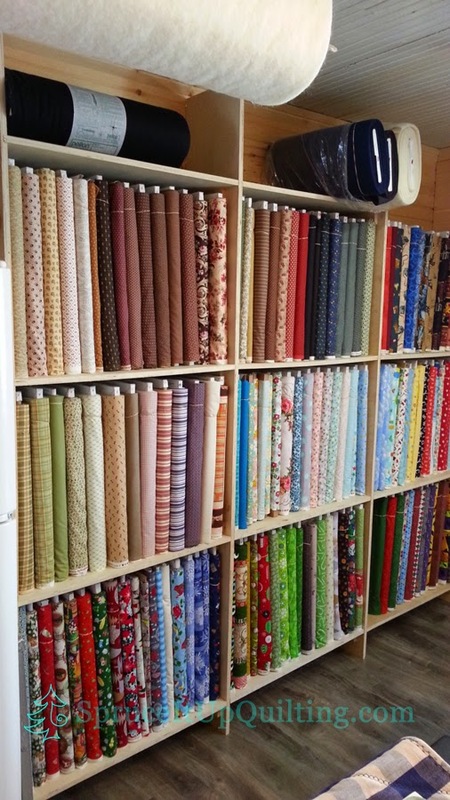 It's a welcome addition and a wonderful way to display some of the new fabrics. On Monday, Batik and Homespun fabrics arrived! OH MY!!! Back to boxes on the floor!! !